In these drawings of cartoon tigers, I tried to portray this jungle character as a friendly chap, to show you that can do whatever you like when you are drawing cartoons. 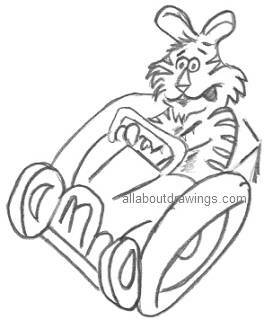 I like to provide a simple outline of a basic cartoon tiger drawing so you can copy it successfully. 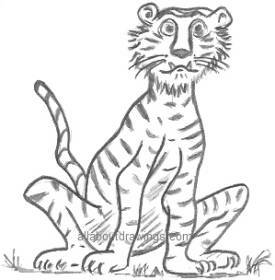 It's so simple that you can draw this cartoon tiger, right? I think it resembles the shape of a light bulb with ears and a face! Remember with cartoons that all features are exaggerated and you can add lumps and bumps to the body and get away with it - like you intended it to be that way. This tiger below looks more like a rabbit to me but the stripes tell you it's a tiger! He's also driving a crazy looking car. You need general information about tigers to be able to properly illustrate them in cartoon form. A tiger's coat is brownish-yellow to a burnt orange color and is marked with black stripes. On real tigers, the stripes look quite neat and ordered but on a cartoon tiger we can put the stripes anywhere and anyhow we please. There is longer hair around a tiger's face. On male tigers there is more hair than the female. Still, the tiger does not have as much hair as a male lion. Their bodies are quite similar though, due to the fact that both are members of the cat family. When you think about creating some drawings of cartoon tigers, you can place them hiding behind some grass, or leaning against a tree, or wherever your imagination takes you. Just like I did above, with the tiger in a car. This dude looks a bit angry. His face is out of proportion but I'm just throwing ideas out there for you to create something different. At this stage, I have been drawing for 8 months. If you asked me to draw this at the start, I doubt I would have even tried for fear of failing. Fortunately, I have lost the fear of failure because no one dies if I produce a disasterous image. Nothing bad happens. I know now that I can attempt to illustrate anything and I'm the only one who sees the results. You will gain confidence by drawing everything that looks simple to you. Be prepared to have success with some but not others - that is a normal part of learning. If you really want to draw, just remember to keep trying and you will get there. 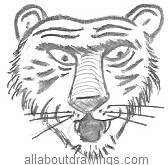 Create drawings of cartoon tigers that make your friends laugh. Off you go, be patient and experiment. Every sketch you do will be better than the last one. I wish you many happy cartoon creations!